Eric Broug, originally from the Netherlands, received his Masters degree in the history of Islamic art and architecture from the School of Oriental and African Studies, London. He runs Broug Ateliers for Islamic Architecture, Arts and Crafts in Yorkshire, which creates contemporary Islamic art. Where can I find Islamic Patterns? Eric Broug: You can find islamic patterns in art and architecture. They appear on objects such ceramics and metal bowls, in qur’ans, in miniature paintings, on belt buckles, book covers. They appear on daily objects and more ceremonial objects. This has been the case for centuries. In architecture, you can find these patterns in religious buildings and buildings with no religious purpose, you find them on walls, floors, ceilings, domes, doors etc. What about the history of Islamic patterns? Eric Broug: No art comes to being in vacuum. There are always human beings involved who have been influenced by what came before. This is also the case for Islamic geometric design. You can see that in early Umayyad architecture, the craftsmen and builders used design motifs from Roman mosaics and turned this into a new artistic language that can be seen as the early steps of Islamic geometric design. Similarly, pre-Islamic tradition in Persia also influenced what developed into the geometric design tradition in that part of the Islamic world. How can I increase my creativity by drawing Islamic Patterns? Eric Broug: You can increase your creativity by creating a space for yourself in your home that is always ready. We all have busy lives and it is hard to find time to be creative. It helps a lot of you have a desk or table with paper, pencil, a pair of compasses etc ready for action. So, that, when you have a bit of time, you can sit down and start straight away. Why are Islamic Patterns important for you? Eric Broug: To me it feels as if Islamic geometric design chose me, rather than the other way around. 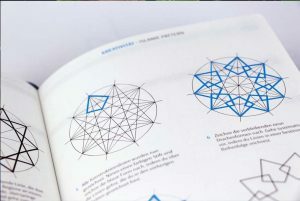 Every day for 25 years, Islamic geometric design has offered me creative and intellectual challenges. It has also taught me about persevering with what you believe in. I find it endlessly fascinating. Over the years it has evolved from a individual pursuit to greater understanding to, now, where my passion is very much about teaching and explaining. 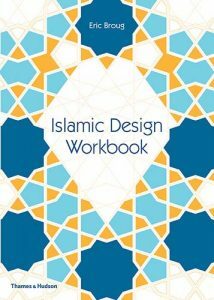 Which knowledge of geometry do I need to understand and reconstruct Islamic patterns? Eric Broug: If you understand that all these patterns can be drawn with just lines and circles, it starts to become more accessible. You don’t need to be good at maths, you just need an inquisitive mind and a desire to learn. In the same way that the construction of these patterns is a specific step-by-step process whereby you need to do A before you can do B, the learning process is the same. You gradually build up your knowledge and understanding and it becomes a solid foundation. Gründer und Designer von MUSLIM PLANNER ist Bilal Erkin aus Köln. Als studierter Islamwissenschaftler und Informatiker war er in der Start-Up Phase vieler sozialer und muslimischer Projekte involviert. Durch die Herausforderung, in kurzer Zeit viel zu erreichen, war er stets gezwungen, seine Zeit effektiv zu nutzen ohne das Wesentliche aus den Augen zu verlieren. Durch zahlreiche Gespräche mit muslimischen Studierenden und Berufstätigen weiß er, dass er die Herausforderung mit vielen teilt. Aus diesem Grund hat er den Muslim Planner entwickelt.